ON NOV.11 IN LA: MARCH FOR JUSTICE, EQUITY AND PEACE! MARCH FOR JUSTICE, EQUITY AND PEACE! Everbody is ready for the Ninth Veterans Day Protest March next Thursday, November 11, 2010 in Los Angeles! The Justice for Filipino American Veterans (JFAV) still calls on all community organizations, school and youth organizations in Southern California; advocates of justice and peace, veterans groups, widows and relatives of veterans to join the protest march to downtown Federal building on Veterans Day, November 11, 2010. The assembly area is at Search to Involve the Filipino Americans (SIPA), 3200 W. Temple St. Los Angeles, CA 90026 at 9;00 AM. The march route will be from Temple St right at Glendale to 2nd St to downtown Federal building at 300 Los Angeles St, Los Angeles, CA 90012. The march will start at 10:30 AM. Los Angeles— MARCH FOR JUSTICE, EQUITY AND PEACE! Everbody is ready for the Ninth Veterans Day Protest March next Thursday, November 11, 2010 in Los Angeles! The Justice for Filipino American Veterans (JFAV) still calls on all community organizations, school and youth organizations in Southern California; advocates of justice and peace, veterans groups, widows and relatives of veterans to join the protest march to downtown Federal building on Veterans Day, November 11, 2010. The assembly area is at Search to Involve the Filipino Americans (SIPA), 3200 W. Temple St. Los Angeles, CA 90026 at 9;00 AM. The march route will be from Temple St right at Glendale to 2nd St to downtown Federal building at 300 Los Angeles St, Los Angeles, CA 90012. The march will start at 10:30 AM. 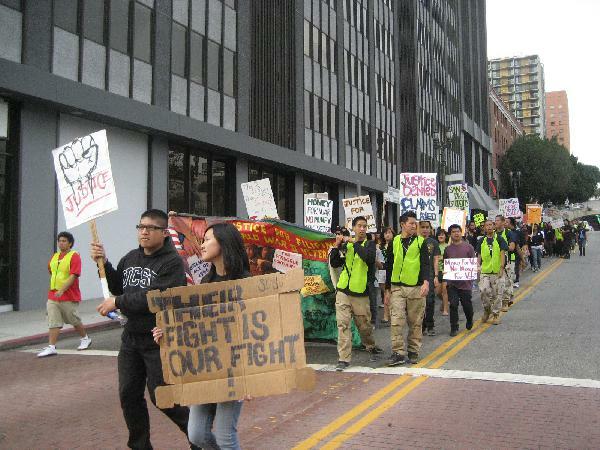 The 9th Veterans Day Protest March was a carry-over from the Annual Veterans Day Parade in Historic Filipinotown started by People’s CORE and the Justice for Filipino American Veterans (JFAV) in 2001. It used to be a parade in honor of Filipino World War II Veterans who fought for America and freedom during the Second World War from 1941-1945. Set to participate are Filipino American youth organizations from 16 schools, community and people’s organizations and non-profit organizations in Southern California.Some of the student and youth are Kappa Psi Epsilon, XPO, Chi Omicron,TDB, Samahang Pilipino at UCLA, Kababayan of UC Irvine. Katipunan UC Riverside, CalPoly BARKADA, FASA from CSUN, Long Beach PAC, USC Troy Phi, Loyola Marymount, Andres Banifacio Samahan from San Diego. Also set to participate is the ProPeople Youth KMB, AFFIRM AND AJLPP. to mention a few. Filipino American Veterans (UFAV), VFP-UC Chapter , AWARE-LA, Seniors for PACE, Echo Park Community Coalition (EPCC), Filipino Christian Church,(FCC), Pilipino Chamber of Commerce of Southern California, PSL, BANTAY PILIPINAS, ANSWER-LA, People’s CORE and others will send participants. The Pro People Youth KMB from Los Angeles and San Diego, AJLPP and AFFIRM will also join the protest march. Also invited speakers are California assembylmen –elect Gil Cedillo of District 45 There will be a program before the march –rally to downtown LA. Music will be provided by the Ube Family from the FCC. 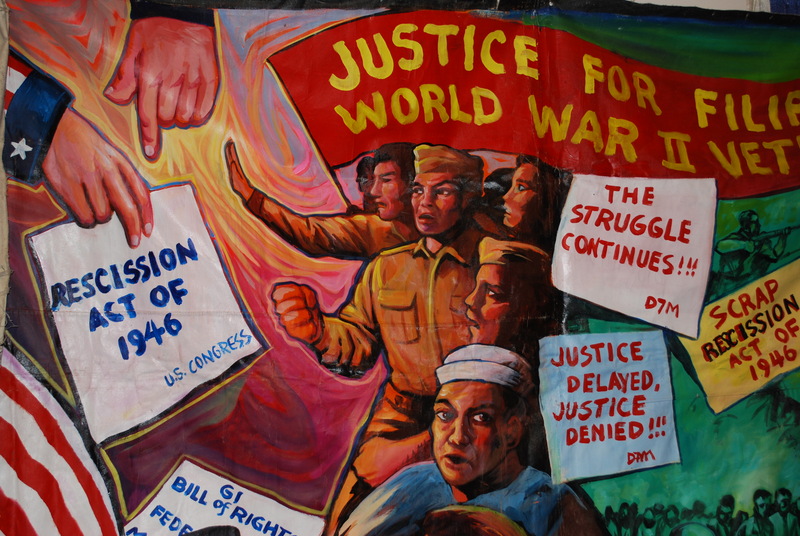 The Justice for Filipino American Veterans (JFAV) has to change the theme from a parade to a protest when the Department of Veterans Affair (DVA) denied more than 20,000 veterans of their lump sum claims in 2009. These means the veterans have to go through a circuitous and tedious appeals process that eventually deny them of their claims. The Justice For Filipino American veterans (JFAV) the Association of Widows, Relatives and Advocates for Equality (AWARE) and the Migrant Heritage Commission helped the veterans and widows and their heirs to file a civil suit against the DVA last October 8, 2010 in San Francisco. CLAIMS DENIED IS JUSTICE DENIED! KARAPATAN NG MGA BETERANO AT BALO, IPAGLABAN! MARCH FOR JUSTICE, EQUITY AND PEACE!